The Historical Mile lies along the M4 Main Road, commencing at the Simon's Town Railway Station Goods Depot (-34.185327, 18.424996) to Belmont Road (-34.195760, 18.445253). This includes Station Road, St. George's Street and Queen's Road and all of the properties along both sides of these roads between the specified co-ordinates (click here to view on google maps). Whilst elements of the Historical mile had been in existence since the 1740s, it was the General Plan of Simon's Town drawn up by Surveyor L.M. Thibault in 1815 that captured the significant buildings. On 27th May 1814 Simon's Town was proclaimed a District entirely separated from Cape Town and the Cape District. The town developed in a linear pattern, dictated by the narrow stretch of level ground between the beach and the mountainside. Whilst the initial buildings were comprised of a mix of Cape Vernacular, Cape Dutch and utilitarian storehouse designs, the increasing prosperity and demand for shops, offices and living accommodation brought architects such as Sir Herbert Baker (1862-1946) and John Parker (1866-1921) to the town. Parker alone was largely responsible for today's appearance of the central core of the the Historical Mile. 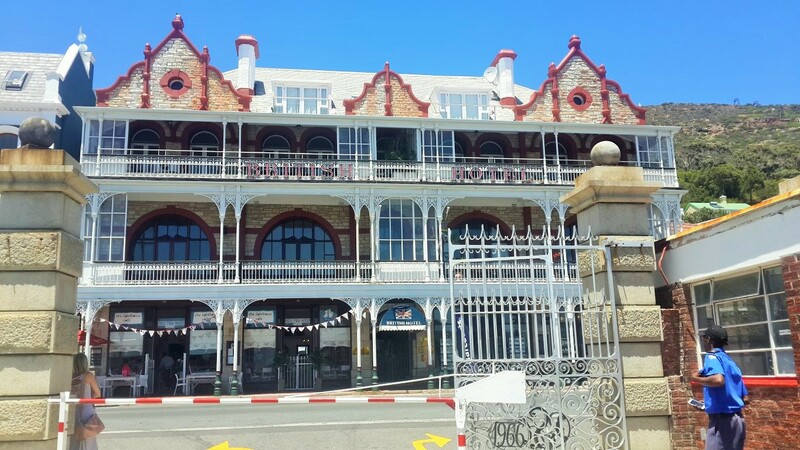 Apart from designing the iconic British Hotel, the adjoining ABC Building, the United Services Institute, Simon's Town High School (now the Public Library), various shops and numerous private houses, Parker brought the Victorian fashion of cast iron "Broekie Lace", balconies supported on slender cast iron columns and decorative cast iron railings. Many of these features still exist today, and collectively they form the defining aspect of the Historical Mile and its Sense of Place. Other elements such as the Lanes and the Steps that provide access to properties higher up the mountain slopes further contribute to that Sense of Place, together with glimpses of the Naval buildings within the Dockyards. This visual impact is complemented by the recorded history of events, activities and the people who resided in and visited the Historical Mile; it is truly unique not only within South Africa, but in many respects the Southern Hemisphere. It is therefore vital that this vista, and its associated history, be conserved for future generations. Significant changes were introduced by the departure of the British Royal Navy, and the Forced Removals. These led to a decline in customers for local shops and businesses, which has been only partly offset by tourism. As a result, there is a now a curious mix of shops and businesses in the town: a large number of Estate Agents, some good Restaurants, a sprinkling of Spaza shops - but no key 'anchor' businesses such as Banks, no quality Supermarkets. The tailors and outfitters, ladies' couture, even Do-It-Yourself shops have long since departed, unable to survive the high business rates demanded by the City of Cape Town, and the possibly higher rentals demanded by property Landlords. Collectively, this has had an adverse impact upon the look of the Town Centre. Unsuitable advertising screams to attract custom; shop windows are painted over - the days of attractive window displays appear to be over, replaced by serried rows of property adverts. Gradually, the streetscape has dwindled downmarket. If these trends are not reversed, the attractiveness of Simon's Town as a Tourist Destination will decline. A concerted effort is needed to upgrade the appearance of the Historical Mile. This will entail support from the Business Association, in setting and enforcing standards. The City of Cape Town Signage Guidelines need to be enforced; developments need to comply with the "Guidelines for the Conservation and Development of the Simon's Town Conservation Area", published by the Simon's Town Architectural Advisory Committee (AAC). In recent times, public consultation for controversial or patently unsuitable development proposals have been curtailed or even circumvented by Council officials. Simply rubber-stamping approval of such proposals is entirely unacceptable, and the officials' mindset must be reset - possibly by holding some workshops to engage with the officials concerned and to enlist their support in the Simon's Town Conservation objectives.